Three weeks have passed since Election Day in Wisconsin, Rethinking Schools’ home base. The Monday-morning quarterbacking started moments after Democratic challenger Tom Barrett made his concession speech. Some of the postelection analysis was smart and insightful, but those pieces were mostly drowned out by pundits and opinion writers who never set foot in Wisconsin, never knocked on a single door, or made a single phone call to a potential voter. Their analyses were crass, insensitive, and some were even misinformed about how the movement here developed. We thought it would be a good idea to share the voices of educators and activists who were on the ground during the months leading up to the recall. To remind others and ourselves that real people are behind uprisings like the one in Wisconsin, and are fighting battles that are history in the making—albeit always imperfect. Barbara Miner, who has her own blog View from the Heartland, wrote: “There is always something you can do. Always.” Hers was the piece that brought me past the despair and toward a fleeting sense of hope for our future. It reminded me that movements take time, and we can’t give up the fight. There’s always something we can do. Amy Mizialko is a Milwaukee teacher who spent hours upon hours on the ground activating her neighbors and colleagues, and she shared with us the following reflection about her experiences. I have been a teacher for Milwaukee Public Schools for the past 20 years and for the past 16 months, I have been fighting to win the June 5 recall election in Wisconsin. I marched 10 times at our state capitol in the winter of 2011 to protest the unprecedented attacks on my profession, devastating cuts to our schools, and an extreme, anti-worker agenda that has divided our state. There was talk of recall from within the grassroots of the movement. First there were the summer recall elections that reduced the Republican majority in the Senate to 17-16. Following debate within the Democratic Party and among grassroots organizations about the best timing for Walker’s recall, it was decided that we would collect signatures to recall our governor. In mid-November, Milwaukee was buzzing, collecting signatures. I signed my petition and obtained 60 additional signatures that I proudly submitted on Jan. 17. My hope and the momentum of the grassroots surged when we learned we had turned in 1 million signatures, far exceeding the required 540,000 needed to trigger a recall election. After the May primary election that determined who would run against Walker, I immediately pivoted to a full-on campaign for Democratic challenger Tom Barrett. I signed postcards, called voters, canvassed my neighborhood, assisted teachers in helping their students to register and vote, and organized teachers to canvass in their school neighborhoods. In the two weeks prior to the election, I watched Milwaukee rise up and believed we would win. Although I was prepared to win or lose the election by the slightest of margins, I never prepared myself to lose big, for the race to be called minutes after the polls closed while voters were still standing in line, some for the first time. I looked at the crestfallen faces of my closest colleagues and friends who had worked more and harder than ever before. When the race was conceded, I bolted to my car raging and weeping. Despite our success at turning out Milwaukee to the polls at a rate of 76 percent, it was not enough. On June 6, I awoke distraught, hopeless, and defeated. June 6 was a quiet day that ended with my monthly union meeting. I fought back tears as I gathered with my union sisters and brothers and listened, disbelieving, as people said we would fight on. My colleagues thanked me for my work and all I could think was that it was all for nothing. For the first time in the past 16 months, I felt weak, beaten, and at a loss for how to recover. On June 6, I learned of the workers’ fight to form a union at Palermo’s Pizza in Milwaukee. Soon after union organizing efforts began, the frozen pizza company began its antiunion campaign, threatening workers with termination and immigration audits. On June 8, I marched with the Palermo workers in solidarity and a little hope returned. From February 2011 until June 5, 2012, I woke up every day with unwavering certainty that my work was important and that I must do it. Every day of the last 16 months has been an opportunity to live out my beliefs and every minute was worth it. Any sacrifice I made pales in comparison to the $1.6 billion cut to our public schools. Any sleep I lost is nothing compared to the 65,000 Wisconsinites, seniors, the poor and disabled, and 29,000 children who lost government-sponsored health care coverage. Any pain I endured fades away when stacked up against the $500 million cut in Medicaid that seniors and the poor must endure. Losing the election almost broke me, but on June 8 I stood up again because there are still good people in every part of our state, nation, and around the world fighting for economic justice, fairly funded public education, and for basic rights of safety and humane treatment in the workplace—the Palermo Pizza workers in Milwaukee, my fellow teachers in Chicago, bus drivers in London, and the Nuns on the Bus. Mahatma Gandhi said: “When I despair, I remember that all through history the way of truth and love have always won. There have been tyrants and murderers, and for a time they can seem invincible, but in the end, they always fall. Think of it—always.” We are one and I will fight on in solidarity. 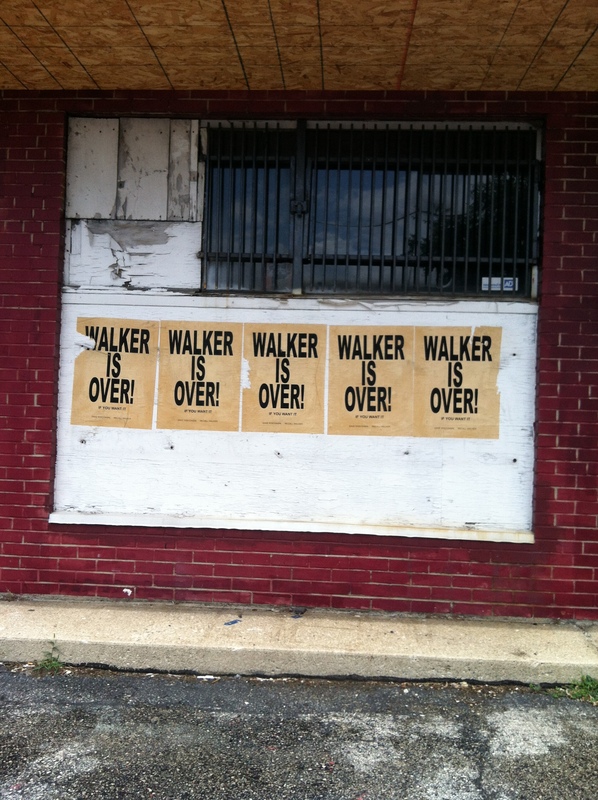 And no, Walker’s not finished yet, but neither am I. Posted on June 26, 2012 by Rethinking Schools	This entry was posted in Current events and tagged activism, election, labor unions, protests, public schools, public sector, recall, walker, Wisconsin. Bookmark the permalink. ← Who’s talking about the summer issue? I feel energized reading this … and I don’t even live in Wisconsin. Thank you. Thank you, Amy, for your beautiful and passionate words. You are so right ~ we are not finished yet. History will continue to bend in the direction of the realization again of true democracy. Amy, your spirit shines in this blog post. You ignited many fires, brought new activists to the scene and provided a creative spark that kept our struggles going. I am proud of how hard we fought. When people ask if I begrudge the personal time sacrificed in what was ultimately a loss my response is always a resounding no. Electoral defeats occur every election cycle. The victory was in the movement and the movement will continue until our rights are restored. Well said, Amy. We had our shoulders back and our voices raised for so many months…we gain nothing by dropping our heads and only looking at the ground in front of us. Together, we are strong! Thank you, Amy, for giving voice to the passions, disspointments, and continued hope of so many. You inspired me throughout the past 16 months and still do so every day. Solidarity to all!